The proceeds of this event go to the Child Abuse Prevention Service. This organisation has dedicated 46 years of its life to the Prevention of Child Abuse. There are a number of different Sponsorship opportunities to present your company and take a place in this important time. We all have a responsibility and an opportunity to make critical changes for businesses involved in children as well as helping heal the damage of the past. 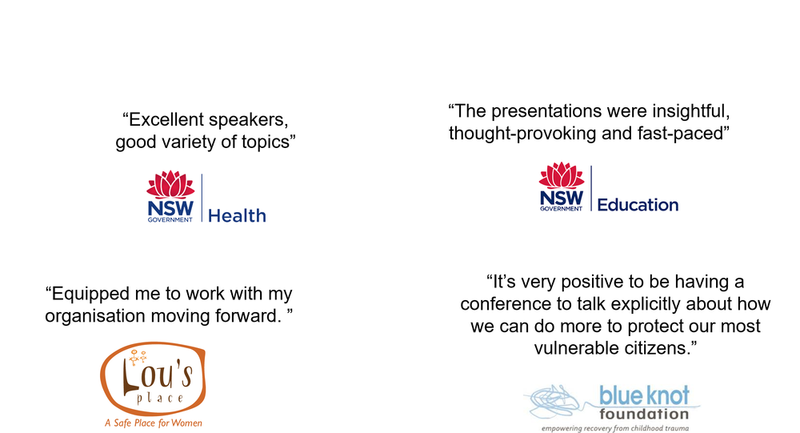 This is a high profile topic and speakers include representatives from a variety of organisations who shape and influence Australian child safety, speakers include Janet Schorer: NSW Children's Guardian, Kathryn Mandla Head: National Office for Child Safety, Jane French: Executive Director of Child Wise, Dr Kieran Le Plastrier: MBBS (Hons) MP PhD FACHI, Psychiatry SMO, Researcher, GP (trainee), Emma Gierschick, Children of Disability Australia and more. The sponsorship packages below are an example of the deliverables available, please contact us to discuss your requirements, packages are not limited to the below deliverables.